Family owned and operated since 2008. We pride ourselves on providing a superior level of maintenance for our tenants. Tenant comfort and satisfaction is our main priority. Our “Easy Living” motto means that our tenants can relax and enjoy life because we’ll handle all of life’s inconvenient surprises! 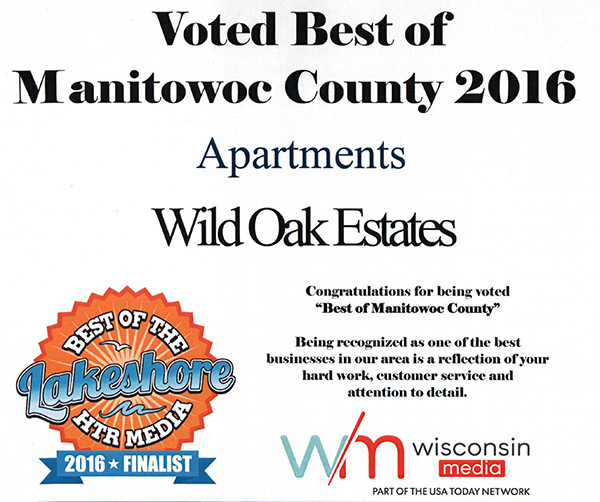 Wild Oak Estates consists of three secure apartment buildings. All of our units have convenient one or two car attached garages. Built in 2003, buildings 1901 and 1911 are open concept 2 bedroom/2 bathroom units with full size washers and dryers in each unit. Regional Real Estate, LLC purchased the development in 2008 and immediately began updating, renovating and improving both 1901 and 1911 buildings and the development grounds. Constructed in 2010, building 1921 features the same desirable open concept unit design as the original buildings, additionally several three bedroom units were added to meet market demand. An enormous amount of attention to detail in the design and construction process of 1921 produced a building that was overwhelmingly welcomed into the Manitowoc market. Conveniently located on the north side of Manitowoc just off County Highway B (North 8th Street) and Albert Drive with easy access to Highway 310 and I-43. Across the road from Wild Oak Estates is Indian Creek Park, a 46 acre park abutting the Little Manitowoc River. Indian Creek Park is a beautiful recreational area for walking and hiking, exercising your dog, playing Frisbee golf on the 18-hole disc golf course or enjoying the sounds and sights of nature. Boardering Indian Creek Park is the City of Manitowoc Dog Park Exercise Area #1, which consists of 21 rolling acres specifically designated for city residents to exercise their dogs off leash! Throw a ball or just let them run free - what a wonderful asset within walking distance of Wild Oak Estates. Prewired for cable and satellite T.V. Entire building is fully warranted. Call management & all repairs are promptly made.